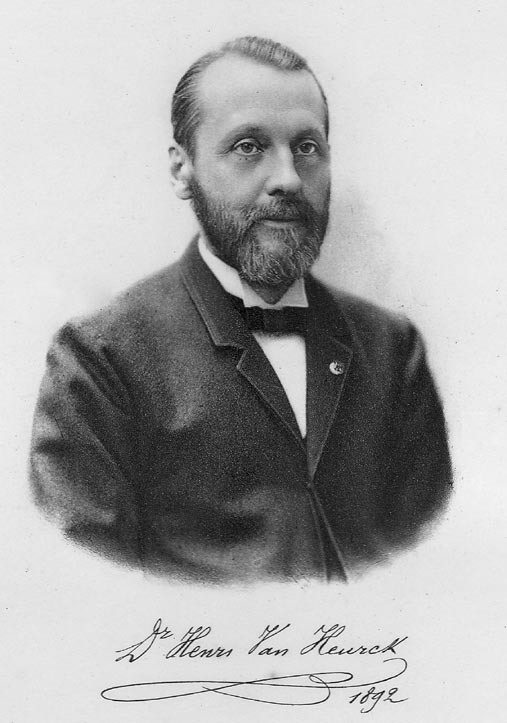 The famous Belgian microscopist, Henri Van Heurck(1839-1909) was the manager of his family business manufacturing paints and varnishes. He became famous as a botanist, expert microscopist, photomicrographer, and especially diatomist. More than one diatom species is named in his honor. The basic plan for the Van Heurck stand was based on the earlier Edinburgh stand, a model devised with the advice of an Edinburgh professor. For more historical information about the various models of the Edinburgh microscope see the Edinburgh B page and the Edinburgh H page. 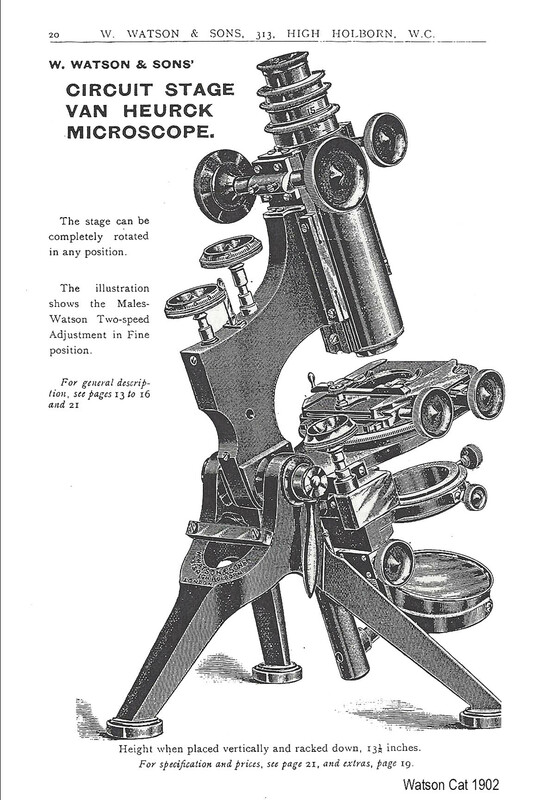 Watson & Sons had been making microscopes since about 1874. For some time in their early production, their microscopes were similar to other contemporary makers, but soon they started to produce a variety of interesting designs, including their own variation of the Walter Bulloch Biological No. 2, and also a version loosely based on Wale's New Working Microscope. In 1887, Dr Edington, a Lecturer in Bacteriology from the University of Edinburgh suggested the first form of the Edinburgh stand; according to Watson's delivery records, the first example was sold on November 29, 1887. This stand was the inspiration for the Van Heurck stand, and like the Van Heurck, started out with a continental foot, but was soon ordered more often with a tripod foot. Like the Van Heurck, it was improved progressively over the years. This culminated in the Edinburgh 'D' and 'H' models, (an example of 'D' is shown to the left), which had most of the basic features of the (later) 'Royal' model. In fact, when the Royal was first introduced, it was actually slightly smaller than the Edinburgh H. The various Edinburgh stands were at first indicated by the numbers 1,2,3, and 4, but by 1890, the letters A,B,C and D were used. In 1889 or before, with all of his expertise, Van Heurck suggested the design of a microscope to his specifications, and this was the first model of the Van Heurck microscope made by W. Watson and Sons; the prototype was apparently delivered to Van Heurck in 1889*, but there is no entry in the Watson delivery book for the prototype. The first entry for a Van Heurck in the Delivery Books was March of 1891. It was also pictured in the first edition of Van Heurck's book also dated 1891. This first version is identical to the 'Watson No. 4 Van Heurck Stand A' seen in the 1893 catalog. Study of the illustrations shows that this initial Van Heurck differed from the original Edinburgh mainly in two features-the fine adjustment for the substage, and the ability to rotate the mechanical stage. 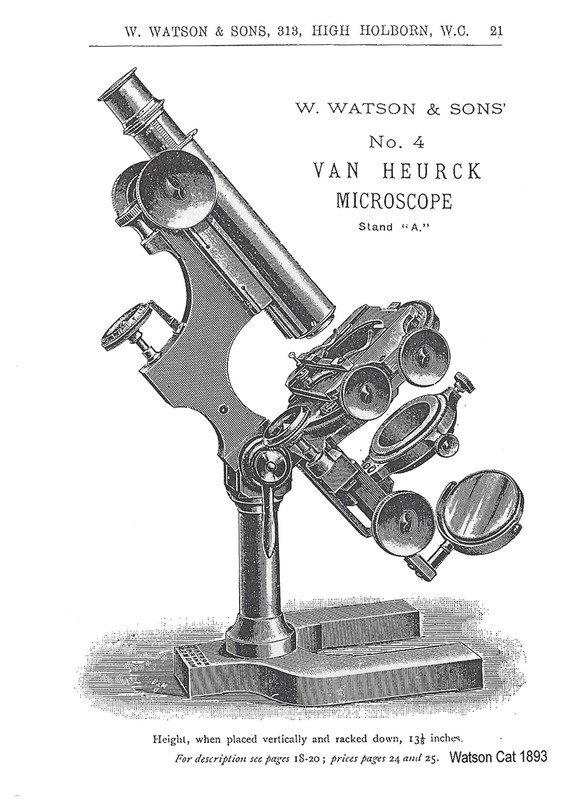 Van Heurck preferred to do all of his photomicrography with a vertically oriented microscope which is why he preferred his microscope to be made with a continental 'horseshoe' foot and supported on a single pillar, so as not to interfere with substage adjustments during the, (then) delicate operation, of photomicrography with high power objectives. At the same time, many others preferred the horizontal position for photography. For this reason, his stand was also offered with the more stable English tripod foot which provided a much more stable stand for photography in the horizontal position. Many more examples with an English tripod exist than with the horseshoe foot, as the tripod quickly became more popular. *An engraving of the Van Heurck 'A' stand was used as a frontispiece to the introduction in the Ninth Watson Catalog; the introduction in that catalog is dated 1889. I would like to thank Allan Wisner for supplying me with this information. In 1896, stand 'A' was no longer listed, but the usual Van Heurck was still called the 'B.' 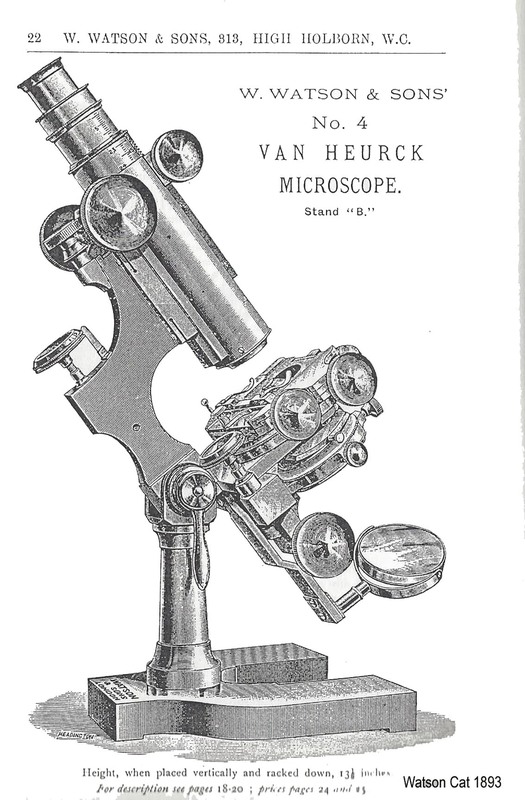 Also in 1896, the 'Grand Model Van Heurck Microscope Stand' was first listed in the catalog. At that time it was listed as identical to the B stand except for three new features: 1)concentric controls for the mechanical stage (after Terrell), 2)complete rotation of the stage, and 3)a slightly larger foot with the Grand, the spread of the foot 'more than ten inches'. By 1898, the Edinburgh stand, which had been steadily improved, reached its final model in the 'H' but even the H continued to have small improvements added over the years. The 'Circuit Stage Van Heurck' was apparently first introduced about 1899 (as quoted in the Illustrated Annual of Microscopy for 1900). Like the Grand Model, it had complete rotation to the stage, but was otherwise identical to the smaller Van Heurck (now just called the Van Heurck without a letter or number), including the stage controls. Later on, the basic model simply became the 'No 1 Van Heurck'. Although listed in the Watson 1900 catalog, the Circuit Stage Van Heurck was not illustrated in that volume. The engraving to the left, from the 1902 catalog, illustrates the Circuit Stage Van Heurck with the optional Watson-Males two speed fine adjustment. It should be noted that from the start, the Terrell type stage could be ordered as an option for the Circuit Stage Model, thus some might look like a 'Grand' but would be distinguishable only by size. To satisfy growing demand for a stand as perfect as the Van Heurck but slightly smaller and therefore less costly, the 'Royal' model was introduced about 1899-1900 as well. The major distinguishing feature between this and the No 1 Van Heurck, was the inability to rotate the mechanical stage (although some models with a rotating top plate are known); it was also of slightly smaller size than the Van Heurck, and initially was even slightly smaller than the Edinburgh H stand. In fact, it is a common misconception that the 'Royal' is generally a larger stand than the 'Edinburgh H' and this is not true. The tripod heights, arm/limb size, foot spread and stage are of identical size in many examples; what makes the 'Royal' appear larger is the larger diameter optical tube and drawtubes including the rack and pinion draw tube. Without these differences and the fact that some 'Royals' have a substage fine focus, the Edinburgh H and the 'Royal' could not be differentiated from one another. This is confirmed by the examples in my collection; the 'Royal' and Edinburgh are virtually identical in size and differ mainly in the diameter of main optical tube, the Royal's double draw tube, and fine focus for the substage. The Van Heurck microscope was offered with many options, and some of these options were to leave off certain standard features for a discounted price. As noted above, it was eventually offered in three different models: the 'No. 1', the 'Circuit stage' and the 'Grand.' At any given time, the Grand was the largest. As noted above, the introduction of the Grand preceded the 'Circuit Stage' Model by about three years. These stands changed over the years and the 'Grand' Model from early years was more like the Circuit Stage model of later years, except for the size. Several features eventually distinguished the Van Heurk microscopes from the Edinburgh H and the 'Royal'. The first was a rotating mechanical stage (not to be confused with ability of the top plate of the stage to rotate, found on some other Watson stands as an option including some Edinburgh models), and the second was the double drawtubes, with the outer bottom one being adjustable by rack and pinion* . Another feature found on these instruments (initially standard, later optional), was a fine focus for the substage, a feature found on relatively few microscopes at the time. Van Heurck himself preferred this to be controlled by a knob projecting vertically from the stage, as seen in the example at the top of this web page, but another option, quickly offered (and seen on the 'Royal' model in this collection), was to place the substage fine focus under the stage projecting horizontally, just above the coarse substage focus control. This below-the-stage version was apparently devised to satisfy some critics who complained that the vertical control interfered with stage access, but it was also slightly less expensive than the vertically projecting version. Eventually many features and option of the Van Heurck were offered on the slightly smaller and less expensive Royal model. The one feature that was never offered on the ' 'Royal' ' was the rotating mechanical stage (although some models may have a rotating top plate, the entire stage does not rotate as a unit as in the Van Heurck models). Although the 'Royal' was almost otherwise the equal of the Van Heurck, it should not be referred to as a ' 'Royal' Van Heurck' as Watson clearly distinguished it from all the Van Heurck models and never claimed it was a Van Heurk (see the discussion of this issue on the Royal Web Page. In fact, Watson stated in their catalog that they produced the 'Royal' because of so many requests to modify the Edinburgh stand to include the features of the Van Heurck such as rack and pinion drawtube and fine focus to the substage. So in fact, the 'Royal' , like the Van Heurck was a derivative of the Edinburgh, but the 'Royal' started as an Edinburgh, not as a Van Heurck. It would, in fact be more appropriate to call it a ' Royal Edinburgh' as it is about the same size as the Edinburgh H, differing mainly in the diameter of the main optical tube and its double draw tubes. For a direct comparison of the Edinburgh H and the Royal, see the Royal and Edinburgh comparison Webpage on this site. The Van Heurck was a work in progress and was continually improved and changed over the years. Early on, the main outer optical tube was as small in diameter as others but it was gradually enlarged to accommodate photography, initially one inch, then one and a half inches in diameter and later, this became two inches in diameter; this increase in tube diameter was also seen on the later versions of the 'Royal' microscope. The size of the foot changed many times over the years as well. The condenser housing on the model shown on this page could not be swung out of the optical axis, but that feature was added later, not only to the Van Heurk models but also to the 'Royal' and the Edinburgh too. Initially the mirror was on a swinging support, but this was abandoned in later models. As more improvements were made, many were offered as options. It is a common misconception that the 'Grand' Model had more features by nature, but in reality, as time went on, all the Van Heurk microscopes had almost all the same optional features, except as noted below. These option included calibrated verniers for the stage X and Y motions (found on the example here), graduated rotation to the stage, rack and pinion stage rotation, adjustable centering of the stage, locking for the stage position, and rotation to the substage. A two speed Males-Watson fine focus was eventually an option on the Van Heurck with separate adjustment wheels for each speed; this option could be ordered on most other Watson microscopes at that time; see the Holos Fram, for example. Another option was the location of the substage fine focus as noted above; eventually the very presence of the substage fine focus was an option. The main permanent differences between the three models of Van Heurcks were the ability to fully rotate the stage on the Circuit stage and Grand Models (but not on the the No. 1 where the stage could rotate, but not 360 degrees), the concentric mechanical stage controls for the Grand (but also available as an option for the Circuit Stage Model, starting in 1900), and the size of each stand, the Grand being the largest, the No 1. and the Circuit stage being smaller. Because of all the possible combinations of options, and also because their size changed over the years, few Van Heurck Models are exactly alike. A chronology of these developments follows, and a comparison of some of the features of these microscopes is noted in the table below. 1874-: Watson starts to produce microscopes. 1874-1887: Watson produces microscopes of the usual designs but eventually makes their own version of other famous stands including those of the American makers, Bulloch and Wale. 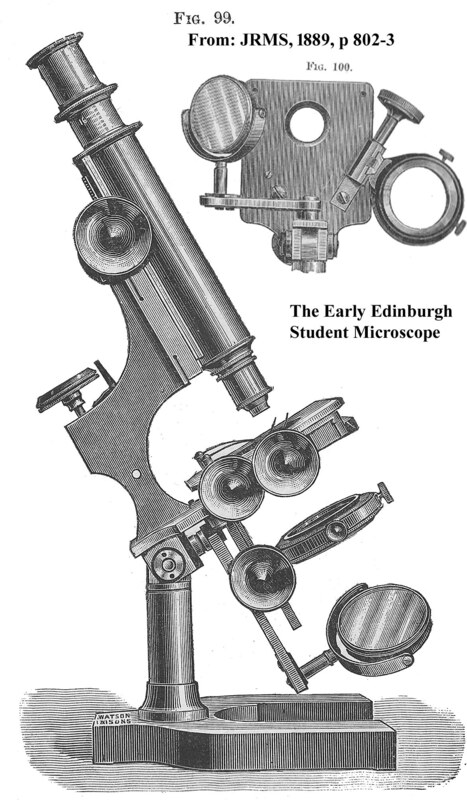 1887: The first Edinburgh microscope is sold, based on suggestions by Dr. Edington of Edinburgh. 1889: Henri Van Heurck proposes the initial design for his microscope. 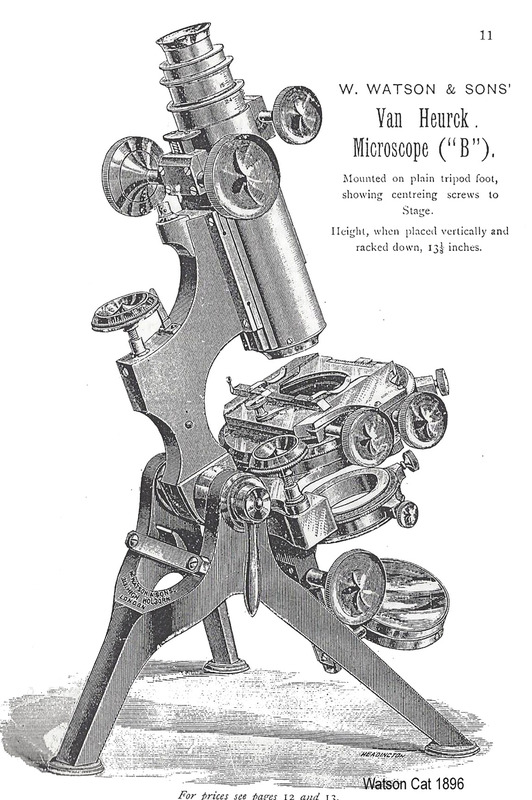 1889: The first Van Heurck microscope, apparently a prototype is pictured as the frontispiece of the Watson 1889 catalog, but not listed. The engraving is identical to the engraving in the 1893 catalog for the Van Heurck 'A' Stand. 1891: The first entry in the Watson Delivery Books of a Van Heurck microscope, being based on the Edinburgh stand. It had a 'horseshoe' foot. 1893: The Watson Catalog offered the No. 4 Van Heurck microscope in two versions both with a horseshoe foot; Stand 'A' had only a single drawtube and did not have a rack and pinion adjustment to the drawtube. Stand B had a larger diameter main optical tube with two drawtubes, the lower one adjustable by rack and pinion. Either version could be obtained with a tripod foot as an option for additional cost. 1900: The 'Circuit Stage' Van Heurck Model is introduced. It has the complete rotation of the stage but is otherwise identical to the 'B' stand. 1900: The 'Royal' is also introduced, smaller than the Van Heurck models, but with options for almost all the same features except for stage rotation; the 'Royal' was never offered with stage rotation. It is initially slightly smaller than the Edinburgh 'H' model! Standard features included the double drawtube with rack and pinion adjustment to the lower one. Initially, substage fine adjustment was standard on the 'Royal' but located under the stage near the substage coarse adjustment. Later this became optional. *-It becomes even more confusing, because eventually, even the rack and pinion adjustment for the drawtube could be ordered as an option on 'lower class' microscopes such as the Edinburgh stand. The following table lists options (including optional deletions) for the Edinburgh, Royal and Van Heurck Models. It may be incomplete, as the author has not had access to every single Watson catalog relevent to the period. 1896 Identical to the Van Heurck 'B' Stand, with the addition of concentric controls for the mechanical stage, and extension of the stage and arm forward to allow complete stage rotation and larger overall size. Identical to Van Heurck 'B' model. 1900 Identical to Circuit stage Model, but larger Identical to Circuit stage model but optionally the same stage as the No. 1 instead of fully rotating, reduced the price by 3 pounds. 1902 Identical to Circuit stage Model, but larger Identical to Circuit stage model but optionally the same stage as the No. 1 instead of concentric controls, reduced the price by 3 pounds. Also option of Stringer's fine adjustment, or Males-Watson Two speed fine adjustment, or Spindle Milled-head fine adjustment, all at extra cost. Optional hinged substage so it can be swung out of the optical axis. Also a substage bar extension sliding on dovetail to allow greater range of accessories of different heights. 1906 Identical to 1902 Same as 1902 but also offered the Scop Mechanical Stage instead of the usual circuit stage, price the same as the standard model. 1921 Same Side Limb or Horizonatal fine adjustment for same price. The author would like to thank Graham Marsh, Dr Joe Zeligs and Allan Wisner for help, references and advice pertaining to the information on this page.